KIT DE LIMPIEZA APP CLEANER SILIMEX PARA TABLETAS Y TELEFONOS CELULARES. KIT ESPECIALIZADO EN LIMPIEZA Y MANTENIMIENTO EXTERNO DE TODO TIPO DE TABLETS, TELEFONOS CELULARES, REPRODUCTORES DE MUSICA PORTATILES TOUCH SCREEN. FORMULA SIN ALCOHOL PARA UNA LIMPIEZA SIN RIESGOS, NO AGRESIVA Y ULTRA RAPIDA. INCLUYE: 1 LIMPIADOR DE TABLETS DE 60ML. 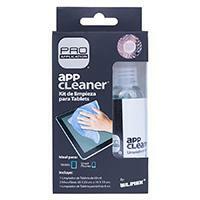 1 LIMPIADOR DE TABLETS PORTATIL DE 8ML. 2 MICROFIBRAS DE 20X20 CM Y 10X10 CM.